Acoustics is one of those sciences most of us take for granted on a regular basis, not because we overlook the importance of sound in our daily lives, but because we underestimate its possibilities beyond speech, music, and as an environmental indicator. Ultrasound, sonar, and noise cancellation are just a few applications that leverage sound waves in capacities that transcend the lay perception of audio. A prime example of how many of us undervalue sound is probably in your pocket right now. Today, smartphones include arrays of MEMS microphones that are used not only to capture and amplify voice during calls, but also to eliminate ambient noise and enable far-field audio zoom using beamforming techniques. Delivering these features requires high-quality microphones with a signal-to-noise ratio (SNR) that typically meets or exceeds 64 dB, as even the most sophisticated audio processing algorithms are restricted by the capabilities of the microphones that are capturing sound. 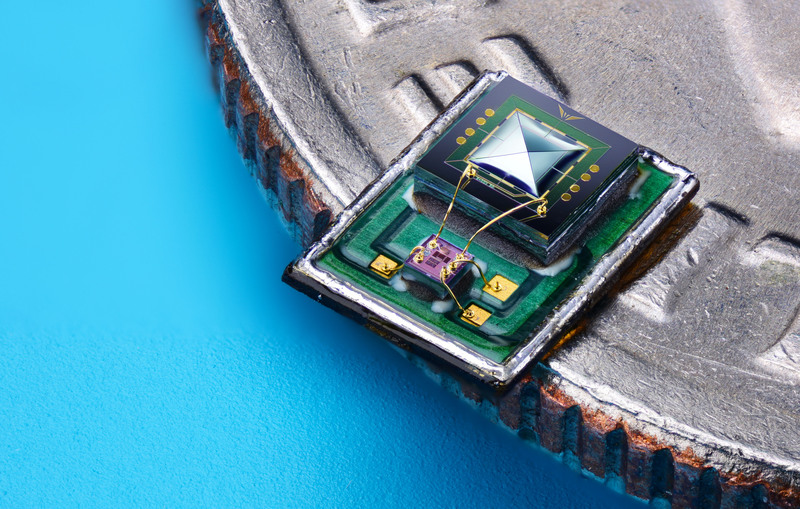 Combined with the large quantities of the smartphone space (billions of MEMS microphones are shipped annually), the demand for quality microphones has resulted in a curious phenomenon in the MEMS market in which the majority of growth and production is occurring at the high end. While the correlation between the smartphone mic market and embedded may not be immediately clear, I urge you to keep reading. At this point you may be asking, “Brandon, why are you talking about smartphone mics in your IoT column?” The reason is that, although speech recognition technology still leaves a lot to be desired, voice will continue to grow as one of the preferred user interfaces for the Internet of Things. Despite the frustratingly low success rate of Siri, “Ok Google,” and Dragon (trust me, I’ve tried almost everything to transcribe interviews), verbal interaction is simply the most effortless form of communication in many scenarios, particularly as everyday objects become Internet-enabled. Think of the possibilities in a smart home that allows you to verbally command your TV, thermostat, and lights (see Amazon Echo), and then think further into the future where microphones could be leveraged in a vehicle to record and transmit engine noises known to be associated with problems or failures, or in a variety of other scenarios for identity management. Fortunately, that curious fact about the smartphone market driving better quality microphones should catalyze the performance gains needed for some of the advanced applications mentioned previously, but there is also room for growth in other areas of MEMS microphones, notably reliability. As many of us have experienced over the day-to-day grind with our smartphone sidekicks, the microphones they equip are highly susceptible to water, dust, and other environmental particulates, and once they’ve been damaged there’s little to no hope of them ever again operating at an acceptable level. 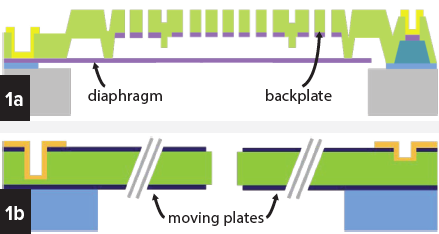 In part, this has to do with the fact that most MEMS microphones today are based on capacitive, two plate architectures that include a diaphragm and backplate (Figure 1a). What often happens when these microphones lose quality is that debris gets caught between these two plates, preventing air/sound waves from passing through the diaphragm freely, or, in some cases, puncturing the diaphragm itself. Recently however, Vesper (www.vespermems.com), a startup out of the University of Michigan introduced a piezoelectric MEMS microphone that relies on four triangular cantilevers (Figure 1b). The advantages of this are twofold. First, the piezoelectric material used converts sound energy directly to electrical voltage, which helps provide a higher quality signal (68 dB typical SNR). Furthermore, because the use of cantilevers eliminates the air gap where particles or residue can get trapped. According to Vesper CEO Matt Crowley, the result is a waterproof, shockproof, and dust- and particle-resistant design. Their latest part, the VM101, is also pin compatible with capacitive MEMS products, helping ease technology transitions and reduce design cycles (Figure 2). Figures 1a and 1b: Capacitive MEMS microphones include an air gap in which water and debris can become lodged and limit performance, while Vesper’s piezoelectric MEMS microphones employ a cantilever design that makes them waterproof, shockproof, and dust- and particle resistant. Figure 2: Vesper’s VM101 piezoeletric MEMS microphone is pin compatible with capacitive MEMS mics to ease engineering design cycles. In the wild of the IoT, reliability and cost are precursors for most any hardware. Given the long lifecycles, designers must be able to depend on system components for years or decades, and in order to reach projected numbers of connected devices, price points for advanced silicon must be in line with those of a high-volume market. These are the precursors for an IoT app enabler. Piezoelectric MEMS mics are on the right track.